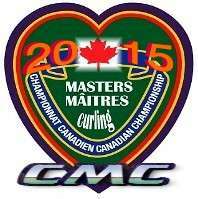 Welcome to Masters Curling March 30  Apr 5, 2015 2015 . Canadian Championship Curling Comes to Whitehorse ! 2015 EVENT RESULTS and INFO- NOW LIVE ! Press Release - 2015 National Masters Championships In Whitehorse YK, March 30  Apr 5. 2015 National Masters Championships , hosted by the Whitehorse Curling Club. The Whitehorse Curling Club has hosted many National events and is recognised for our excellent ice and hospitality. Our 8 sheet facility is considered to have some of the best ice in Canada. If you watched the Scotties you will have heard Russ Howard and Vic Rauter testify to this. The club has locker rooms that include showers and saunas. Immediately prior to the Masters the club has an International Bonspiel so we are hoping that some teams will come early and participate. It would be a great way to check out the ice and discounted hotel rates would be the same as for Masters. The Canada Games Centre, boasting a 25 metre, 8 lane pool, water slide, hot tub, steam room and sauna; an NHL sized arena plus an Olympic sized arena and leisure ice; a Fieldhouse with artificial turf, and a Flexhall for multi sports. For the fitness buffs there is a 215 metre running/walking track and a Wellness Centre with workout machines. Physio Plus also has their clinic here. If we still have snow, the Whitehorse Cross Country Ski Club shares Mt McIntyre recreational Centre with the curling club and they have World class ski trails. Less than a 1hr drive from downtown is the Takhini Hot Springs, a must for aching muscles. Air North is our locally owned airline and provides excellent service 737 to Whitehorse from Kelowna, Vancouver, Edmonton, Calgary, Ottawa, and Yellowknife at affordable rates. Air North routinely gives a 10% discount to anyone 60+ and also feeds you on flights! We are anticipating very Competitive hotel rates for this event!. Yukon has no PST/HST and despite our remote location we are endeavoring to make 2015 an affordable event for all. Named the Wilderness City, the City of Whitehorse is home to some of the most spectacular scenery in Canada. Nestled on the banks of the famous Yukon River and surrounded by rugged mountains and pristine lakes. It has a vibrant city scene and is among the best cities in Canada in which to live, work and play. Visitors to this fair City will not be disappointed. For the shoppers we have big box stores, small boutiques and many stores providing the gold nugget jewelry for which Yukon is famous. We also have a mix of fine dining establishments and fast food restaurants within easy reach of hotels. City of Whitehorse Web site - Please Click to visit - Thank you ! 2015 NEWS and Results TEAM Info, PICTURES + GAME INFO CLIK WCC site Below ! Plan Ahead for Masters Curling Success ! . . Become the Champions of Canada ! win the Gold ! . . . . Get your team in game shape ! Enter and play in Nova Scotia in 2016 !
. . . . . Win your Zone, Region, Province / Territory - Have Fun - Play hard ! . . . . . . Give it a Go ! - Club Sixty+ Athletes play hard !